Preface. A. Handbook of Experimental Design. 1. Historical remarks. 1.1 The diet experiment of the prophet Daniel. 1.2 The lemon experiment of an Egyptian judge. 1.3 Drug research in the 11th century. 1.4 John Stuart Mill and the foundations of experimental research. 1.5 Wilhelm Wundt and the experiment in psychology. 1.6 The invention of randomization. 1.7 Sir Ronald Fisher and randomization. Summary. Questions. 2. The object of experimental design. 2.1 Dependent and independent variables. 2.2 Selection of factor levels. 2.3 Causal relations and intervening variables. 2.4 Ockham's razor. 2.5 Constructs. 2.6 Causal and correlative relations. Summary. Questions. 3. A case for experimental design. 3.1 Threats to statistical conclusion validity. 3.1.1 Low statistical power. 3.1.2 Violated assumptions of statistical tests. 3.1.3 Multiple tests. 3.1.4 Reliability of the dependent variables. 3.1.5 Reliability of the independent variables. 3.1.6 Random disturbance of the experimental situation. 3.1.7 Random differences between subjects. 3.2 Threats to internal validity. 3.2.1 History. 3.2.2 Maturation 3.2.3 Testing. 3.2.4 Instrumentation 3.2.5 Statistical regression. 3.2.6 Selection. 3.2.7 Experimental mortality. 3.2.8 Direction of the causal conclusion. 3.2.9 Exchange of information. 3.3 Threats to construct validity. 3.3.1 Inexact definitions of constructs. 3.3.2 Mono-operation bias. 3.3.3 Mono-method bias. 3.3.4 Hypothesis guessing. 3.3.5 Social desirability responding. 3.3.6 Experimenter expectancies. 3.3.7 Clever Hans and his friends. 3.3.8 Omitting relevant levels of constructs. 3.3.9 Effects of more than one independent variable. 3.3.10 Interaction of testing and treatment. 3.3.11 Restricted generalizability over the constructs. 3.4 Threats to external validity. 3.4.1 Interaction between selection and treatment. 3.4.2 Interaction between setting and treatment. 3.4.3 Interaction between history and treatment. Summary. Questions. 4. Control of extraneous variables. 4.1 Randomization 4.1.1 Randomization and external validity. 4.1.2 Randomization and internal validity. 4.1.3 Randomization in factorial designs. 4.1.4 Multiple treatments. 4.1.5 Randomization and ethics. 4.2 Elimination and blocking off. 4.3 Constancy and covering. 4.4 Matching and blocking. 4.5 Extraneous variables as independent variables. 4.6 Replication. 4.7 Balancing. 4.8 Counterbalancing. 4.9 Blinding. 4.10 Control groups and control conditions. 4.10.1 Control groups for detecting effects. 4.10.2 Placebo control groups. 4.10.3 Control groups for the case that no effects can be detected. 4.10.4 Yoked control groups. 4.10.5 Expectancy control groups. 4.10.6 Solomon design. 4.10.7 Comparison groups. 4.10.8 Historical controls. 4.11 Conservative arrangement of the levels of extraneous variables. 4.12 Repeated measures. 4.13 Statistical adjustment. Summary. Questions. 5. Preliminary experiments and pilot studies. Summary. Questions. 6. Designs which had better be avoided. 6.1 Designs without randomization. 6.2 Designs without a control group. 6.3 Designs with repeated measures. 6.4 Crossover designs. 6.5 Designs with more than two factors. Summary. Questions. 7. Designs without repeated measures. 7.1 Designs with one independent variable. 7.2 Designs with two independent variables. 7.3 Designs with more than two independent variables. Summary. Questions. 8. Designs with repeated measures. 8.1 Designs with one independent variable. 8.2 Designs with more than one independent variable. Summary. Questions. 9. Single-case experimental designs. 9.1 Basic principles of single-case experimental designs. 9.2 Selected single-case experimental designs. 9.2.1 Design with only one factor with only two levels. 9.2.2 Interrupted time-series design. 9.3 An alternative principle of single-case experimental designs. 9.4 Combination of the results of several independent single-case experimental designs. Summary. Questions. Answers to the Questions (with References). B. Dictionary of Experimental Design. References. Author Index. Subject Index. Scientists planning experiments in medical and behavioral research will find this handbook and dictionary an invaluable desk reference tool. Also recommended as a textbook for students of Experimental Design or accompanying courses in Statistics. Principles of experimental design are introduced, techniques of experimental design are described, and advantages and disadvantages of often used designs are discussed. 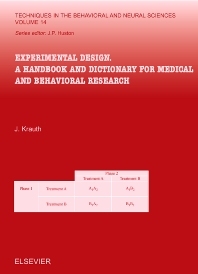 This two-part volume, a handbook of experimental design and a dictionary providing short explanations for many terms related to experimental design, contains information that will not quickly become outdated.